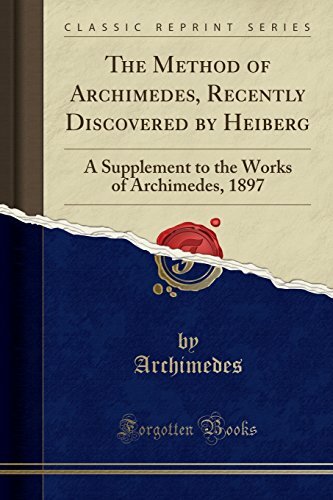 Excerpt from The Method of Archimedes, Recently Discovered by Heiberg: A Supplement to the Works of Archimedes, 1897<br /><br />Greeks had some method or methods of analysis hardly less powerful than those of modern analysis yet, in general, they seem to have taken pains to clear away all traces of the machinery used and all the litter, so to speak, resulting from tentative efforts, before they permitted themselves to publish, in sequence carefully thought out, and with definitive and rigorously scientific proofs, the results obtained. A partial exception is now furnished by the Method for here we have a sort of lifting of the veil, a glimpse of the interior of Archimedes' workshop as it were. He tells us how he discovered certain theorems in quadrature and cubature, and he is at the same time careful to insist on the difference between (1) the means which may be sufficient to suggest the truth of theorems, although not furnishing scientific proofs of them, and (2) the rigorous demonstra tions of them by irrefragable geometrical methods which must follow before they can be finally accepted as established; to use Archi medes' own terms, the former enable theorems to be investigated (oewpe'iv) but not to be proved The mechanical method, then, used in our treatise and shown to be so useful for the discovery of theorems is distinctly said to be incapable of furnishing proofs of them; and Archimedes promises to add, as regards the two main theorems enunciated at the beginning, the necessary supplement in the shape of the formal geometrical proof. One of the two geometrical proofs is lost, but fragments of the other are contained in the ms. Which are sufficient to show that the method was the orthodox method of exhaustion in the form in which Archimedes applies it elsewhere, and to enable the proof to be reconstructed.<br /><br />About the Publisher<br /><br />Forgotten Books publishes hundreds of thousands of rare and classic books. Find more at www.forgottenbooks.com<br /><br />This book is a reproduction of an important historical work. Forgotten Books uses state-of-the-art technology to digitally reconstruct the work, preserving the original format whilst repairing imperfections present in the aged copy. In rare cases, an imperfection in the original, such as a blemish or missing page, may be replicated in our edition. We do, however, repair the vast majority of imperfections successfully; any imperfections that remain are intentionally left to preserve the state of such historical works.